transfer and check in Ta Som Guesthouse / 3* Hotels. UNESCO-World Heritage site since 1992. We walk further to the Terrace of Elephants and Terrace of Yama (the so called lepra king) and see the fantastic reliefs. In the evening, optional Apsara Dance, only 200 metres from your guest house! Overnight in Ta Som Guesthouse in airconditioned room. Transfer with your Remork (Tuk Tuk) driver to Angkor Wat (no tourguide for sunrise!). After sunrise, you meet your tourguide and have at first breakfast (as breakfast box) on the picturesque Srah Srang Water Basin. Enjoy this quite place, the former royal bath. TheEFEO (Ecole Francaise d'Extrême-Orient) has decided to keep this tempelovergrown by the jungle. 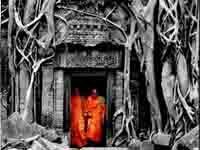 Enjoy the trees growing out from the templeruins and feel like the first explorers and "rediscoverers" of Angkor,like Henri Mouhot or Lunet de Lajonquière. We can organize traditional Khmer massage (from US$ 6 per hour, optional!). enjoy an excursion in air conditioned car/mini bus in the Northern part of the Angkor Archaeological Park. On your way back to Siem Reap, you also visit Banteay Samre Temple. In the evening, enjoy a classical Apsara dance show and dinner buffet included at Kulen II restaurant (6:30pm - 8:30pm). Overnight in Ta Som Guesthouse in air conditioned twin room / 3* hotel. After breakfast in Ta Som Guesthouse / 3* hotels. 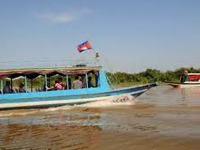 Transfer by air conditioned car / mini bus to Phnom Krom on the shores of the Tonle Sap Lake. After the tour, return to Ta Som Guesthouse / 3*Hotels. From Siem Reap's bus station, all other destinations can be easily reached (Phnom Penh, Sihanouk ville, Battambang, Ho Chi Min City, Bangkok). If you need assistance in booking your tickets, please contact us. Accomodation for three nights in Ta Som Guesthouse / 3*hotels, in air conditioned twin room with private ensuite bathroom with cold/hot water, minibar, Sat TV. The price for 2 persons is based on accomodation in one double room or one twin room. The price for 4 persons is based on accomodation in two double rooms or two twin rooms.